Reverse Charge Mechanism (in case of supplies made by unregistered persons to registered persons) will apply, starting from 1st Feb 2019, only on specified goods/services and specified persons. The list of persons or items subject to the provisions is yet to be notified. Previously, this provision was applicable from 1st Oct 2018. Reverse Charge under GST is a very important topic. There are certain goods & services which attract reverse charge. However, this is not all. As per Sec 9(4) of CGST Act, if a registered person purchases goods/services from an unregistered dealer (URD) then the registered taxpayer is liable to pay GST on reverse charge basis( only for certain goods/services & registered persons). All the provisions of the Act will apply to such recipient as if he were the person liable for paying the tax in relation to the supply of goods or services. Supply must be by an unregistered person. Earlier, Purchases upto Rs. 5,000 per day from unregistered suppliers did not attract GST. In other words, there was a reverse charge on buying from unregistered dealers if you are dealing with unregistered suppliers and making payments above Rs. 5,000. This requirement has been cancelled from 1st Feb 2019 onwards. ABC Ltd. is a registered company which has spent Rs. 7,500 on purchases from a URD. Should it pay GST via RCM (Reverse Charge Mechanism) on Rs. 1,500? The GST is payable on the entire amount of Rs. 7,500 on RCM. Registered taxpayers will have to look into their expenses daily and analyze their P/L accounts to check whether any transactions/expenses fall under RCM. If the expenses are incurred that is covered under the notified list of supplies* then they will be required to pay GST on these transactions under RCM. What is the process of paying tax via RCM on purchases from URDs? 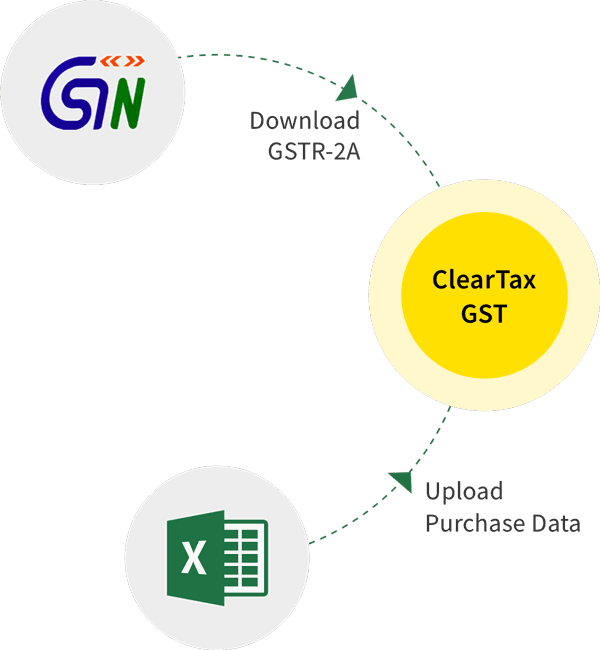 Our ClearTax GST software can help you in this. You will be required to fill up all the correct HSN codes for the goods and services that fall under RCM. This will not be a problem as you can use our HSN calculator for free to find out the HSN codes for all the items. Upload invoice details on our software. While uploading invoices, you can select whether RCM is applicable or not. Our software will read your invoices. If any of them match with the notified list*, you will get an alert message nudging you to declare the same. Our software will identify invoices which do not have any GSTIN and can be subject to RCM. You will be asked to select the appropriate invoice. You will be asked to enter the invoice taxable value and GST payable under RCM. Our software will track these invoices and remember their treatment. If an earlier invoice from the same GSTIN was marked as under Reverse Charge, the system will alert the user that a similar invoice from the same GSTIN had already marked been under Reverse Charge and hence the new invoice may also be under Reverse Charge. What are the Profit & Loss items which might attract GST under RCM? If the supply involves exempted goods/services RCM will not be applicable. A registered person hires an auto rickshaw for commuting from one place to another. This section will not apply as the transportation of passenger by auto rickshaw is exempted from GST. 2. A registered person stays in a budget hotel whose tariff is Rs. 800 per day. Is GST applicable on RCM? Since the room tariff is less than ₹1,000 it is exempted from GST. The question of RCM does not arise.